Building your own house is a more affordable way to provide a family home, providing a cheaper and more cost effective way into home-ownership. While some people tackle the build themselves, it can be a long, time-consuming and costly venture if you are inexperienced. Using an experienced and trusted builder can save you time and money caused by unintentional mistakes and hidden pitfalls. The price of houses has been on the up for some time now and there doesn’t seem to be any sign of this changing. To get on the property ladder or to climb it, for some is not an option in the current market. Building your own can provide you with the house of your dreams but at a more affordable cost. Owning your own home has also proven to be one of the most solid investments you can make in today’s economy. Being in complete control of your build project and having access to cheaper materials results in more efficient project costing, meaning greater savings and a home designed completely to your tastes and needs. For example, getting a great deal on timber can mean you can have marble kitchen work tops or a walk-in wardrobe! 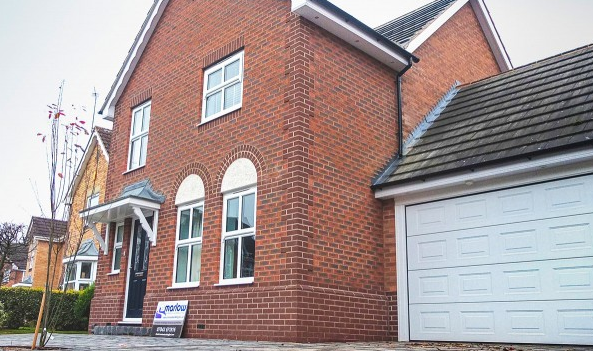 New builds generally mean you end up with more space, better safety features and a house that feels truly yours. They are also more energy efficient and require much less maintenance, which also saves you money in the long run. Many dream of building their own home and self-building can be an affordable way for you to get your ideal property. But unless you are highly experienced or fail to plan properly you can risk financial ruin. Therefore, it is essential you find the right builder you can trust to help you through the process from initial design concepts through to the finished build. Marlow Building & Landscaping have been running successfully for many years, forming strong and effective professional relationships with our clients and the construction industry. We take pride in being reliable, professional, honest and trustworthy and understand how important it is to fully trust those carrying out such important projects. But don’t just take our word for it – take a look at this guide to help you make the right choice of builder for you. Whether you are just at the ideas stage or have full plans we are here to help and offer advice, so please contact us today on 01509 269 407. Not quite ready for a full build? Maybe an extension is what you need – read how to add value to your home. This entry was posted in News on March 15, 2016 by Lindsay Marlow.